AGING DISGRACEFULLY: Aarrg! Twas a good time! Isn't vacation grand! And ain't it busy at work when you return, especially when you are "IT" in the office! Ah well, this too shall pass. 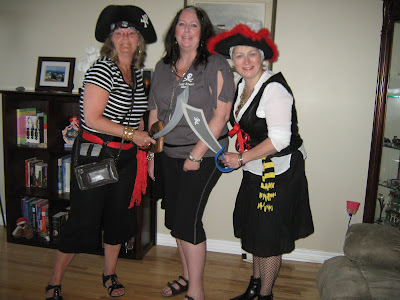 In the meantime, let's have a look at the pirate party I attended. Here's Kim, Carol and I waiting for our cab to arrive to take us to the ferry terminal. (Carol was not the least bit intimidated by our nerf swords.) . 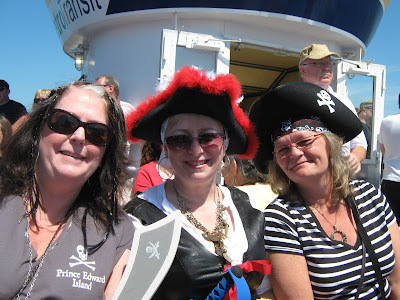 We took the Darmouth ferry to the Halifax waterfront, and it was a glorious sunny day. We got a lot of odd looks and a few "Aargs"; one fellow asked us when our performance began! (And see those pieces of eight around my neck? After 5 min on the ferry in the sunshine, they commenced to begin burning my delicate decolletage! I guess I'm not as tough a pirate as I thought I was.) . 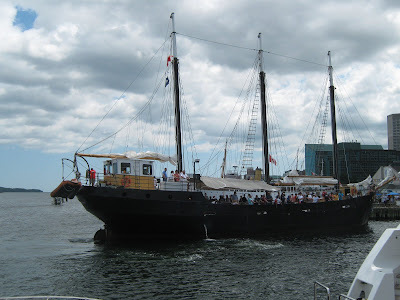 We met a few more pirates at the Lower Deck for grog and grub -- both delicious. .
And then we met our tall ship, The Silva. The party just happened to coincide with the local Buskers Festival; so most people assumed that we were part of the entertainment. I felt like a celebrity: so many people asked to have their picture taken with us; and everywhere were walked, we heard "Aargs" and children saying "More pirwates, Mommy"! 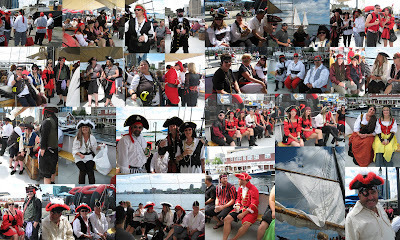 There were 64 pirates on the waterfront waiting to board The Silva! 64 pirates! Some in simple made-up garb, some in gorgeous rented costumes, all of them in good spirits. There were also about 50 non-piratey people on The Silva who had to put up with us. 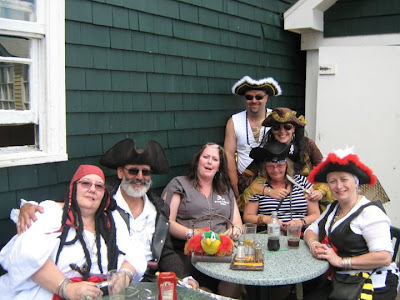 The Silva ran the Jolly Roger along with the NS and Canadian flags; and 2 of our female pirates got to hoist the mainsail. .
After our hour long voyage, we piled back onto the Dartmouth ferry and caught cabs to our hosts' house for food, fun and prizes. 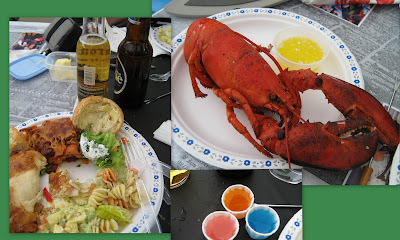 The place was decorated beautifully. .
Then we were treated to either lobster or steak as well as lasagne, chicken, salads, desserts, Jello shots?? and copious amounts of coolers and beer. But everyone behaved themselves. Prizes were awarded later in the evening (everyone got at least one); and the hosts' were cheered and praised and thanked with their own commerative hoodies for this, their 4th annual Pirate Party. .
What fun it was! I stayed in the city for another 3 days visiting friends, sight seeing and shopping; and I'm already scouring the thrift stores for piratey garb. Can't wait until next year! I've never heard of that event (it didn't make the Live @ 5 news did it?) but it sure looks like you all had a blast! Great fun. FANTASTIC! What a day you had! I can imagine how much fun it must have been. 65 pirates! The folk on the waterfront were probably full of smiles when you all gathered. So lovely to finally meet you! 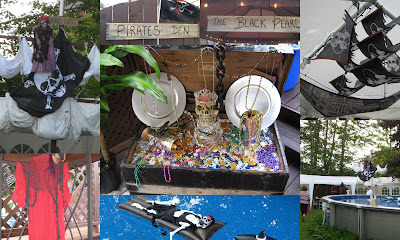 Judging by this post, I (unlike Jerry Seinfeld) wanna be a pirate!